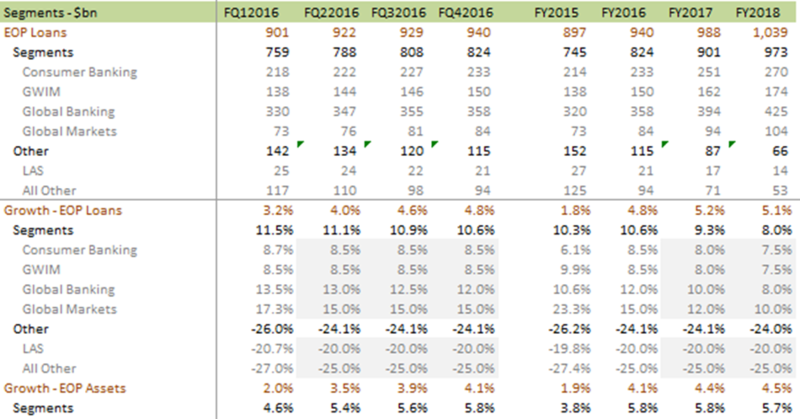 BAC can meet 2017 eps consensus of $1.60 with no improvement from 2016Q1 in the ROA for its core business segments. The consolidated ROA needs to improve from ~0.7% (adjusted for FAS91 and FAS123 effects) to just over 0.8% but this can be accomplished entirely by the reduced drag on returns from the non-core “other” segments assuming management meets its goal of sustaining LAS at breakeven and after normalizing for FAS91; in practice, any back-up in long-term rates will generate windfall non-core gains for a significant eps beat. An undemanding ROA is sufficient for 2017 consensus because of strong loan growth in the core business and a declining drag from legacy portfolios. These legacy portfolios reduced consolidated loan growth by 8%+ in 2015 but will generate a drag of only ~4% in 2017 as they age out of the loan mix to which their contribution will decline from ~17% in 2015 to <10% in 2017. Meanwhile, we expect growth in the core loan portfolio of 9-10% in 2017 versus 11%+ in 2016Q1. We also assume risk-weighted assets, which jumped ~$110bn in 2015 to over $1.5tn as BAC fully adopted the “advanced” approaches methodology in Sep 2015, decline in 2016 with optimization around the new standard and remain below loan-growth in 2017; we note ~$500bn of RWA relates to operational risk which will roll-off over time (although likely not over the model horizon) as recent litigation charges fall out of the regulatory lookback window. 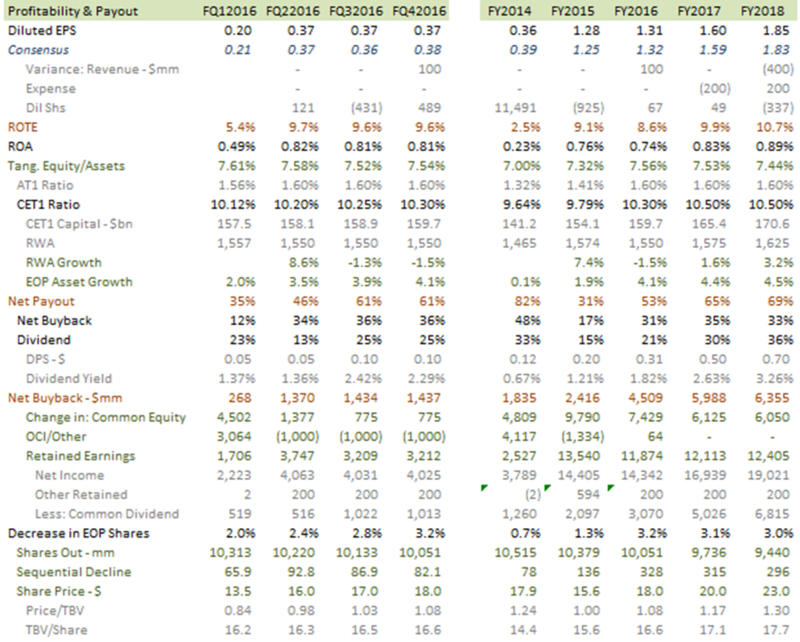 Given strong loan growth in BAC’s core businesses, and a declining drag from the run-off of legacy portfolios, consensus estimates for 2017 eps of ~$1.60 are undemanding of the return-on-assets. This is important because, assuming BAC achieves a fully-phased CET1 ratio of 10.5% (the minimum regulatory requirement plus a 50bps management buffer), consensus earnings will support a net buyback of ~$6bn corresponding, with a dividend yield of 2.6% on a stock-price of ~$20, to a net payout ratio of 65%. Even with the assumed appreciation in stock price, BAC’s buyback can support a 3%+ annual reduction in stock count in 2017 versus the 1.3% achieved in 2015 (Exhibit 1). We assume risk-weighted assets, which jumped ~$110bn in 2015 to over $1.5tn as BAC fully adopted the “advanced” approaches methodology in Sep 2015, decline in 2016 with optimization around the new standard and remain below loan-growth thereafter albeit with the gap narrowing over time; we note ~$500bn of RWA relates to operational risk which will roll-off over time (although likely not over the model horizon) as recent litigation charges fall out of the regulatory lookback window. We also assume OCI effects are absorbed in the CET1 buffer and that CCAR does not bind payout more than notional CET1 as, to optimize around stress-capital, BAC continues to simplify its business model, emphasizes the reduction in earnings variability as legal charges normalize, and focuses on “responsible” (i.e. stress-capital efficient) growth. Our payout forecast assumes BAC generates an ROA of ~0.8% in 2017 which is below management’s intermediate target of 1% and consistent, given a tangible equity-to-assets ratio of ~7.5%, with a tangible ROE of ~10%. Management can meet 2017 consensus with this undemanding ROA because of strong loan growth in the core business segments and a declining drag from legacy portfolios recorded in the “other” segments comprising legacy asset services (LAS) and “all other”. The reduced drag arises because other segments represented ~17% of loans in 2015 but will represent <9% of loans by 2017; the drag from these other segments on loan growth was 8%+ in 2015, so that consolidated loan growth was <2% despite core loan growth of >10%, and will fall to ~4% in 2018 allowing consolidated loan growth of ~5% on core loan growth of 9% (Exhibit 2). Asset-growth will be below loan-growth because of a mix-shift in consumer and global banking to loan assets from securities. 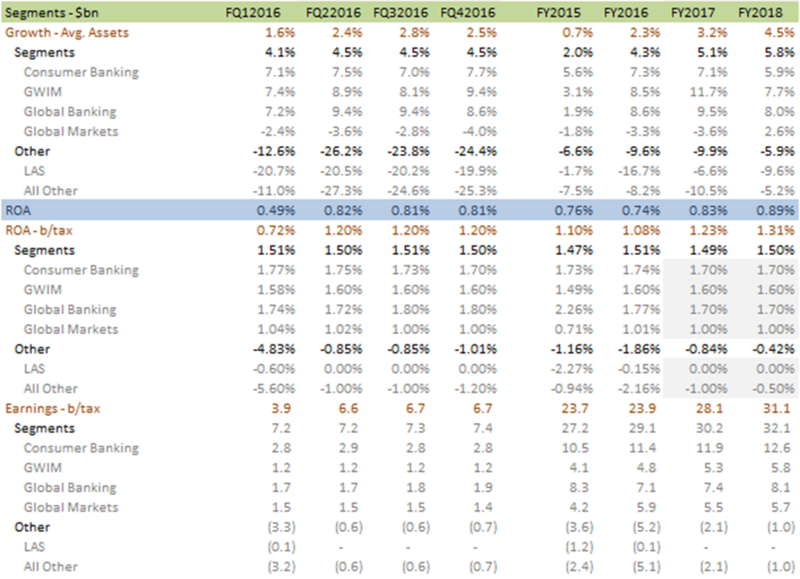 As an arithmetic matter, growth in average assets lags growth in EOP assets but will nonetheless reach 5%+ for the core business segments in 2017 with a drag from other segments of 2%. The resulting growth of 3%+ in average assets at the consolidated level means that BAC can meet consensus earnings with no improvement at all from 2016Q1 levels of the ROA for the core business segments. An improvement in the consolidated ROA, of ~0.7% in 2016Q1 after adjusting for FAS91 and FAS123 effects, is required but this is accomplished by a reduced return-drag from non-core “other” segments (Exhibit 3). We assume LAS achieves and sustains management’s target of breakeven and normalize the return from the “all other” segment in 2017 for the FAS91 effects of ~$1.2bn which drove it deeply negative in 2016Q1.